Wolf Creek Indian Village and Museum is located in Bastian, Bland County Virginia. The recreated village is based upon an actual archeology site circa 1490-1530 AD. 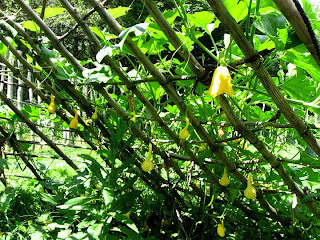 I discovered upon entering the village that one of the wigwams that had the fiber-glass removed from it by an exceptionally strong wind earlier this Spring had accidentally become a brilliant trellis. Some gourds and squash that had been donated to the village germinated at the base of the wigwam. 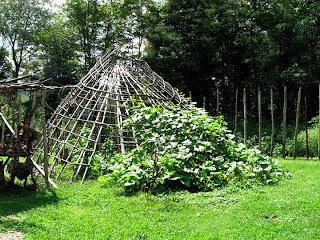 The dome shape kept deer and other pests from reaching the squash as well as keeping the ground shady and moisture in the soil and since the vegetables are kept off the ground there is less chance of rot or blight. As a farily new resident of Wythe County I had heard mention of Wolf Creek but didn't know much about it until finding your blog today. Very informative and a good read!